The EQualizer Post: MANILA FLOODS: Disaster Survival Tips! 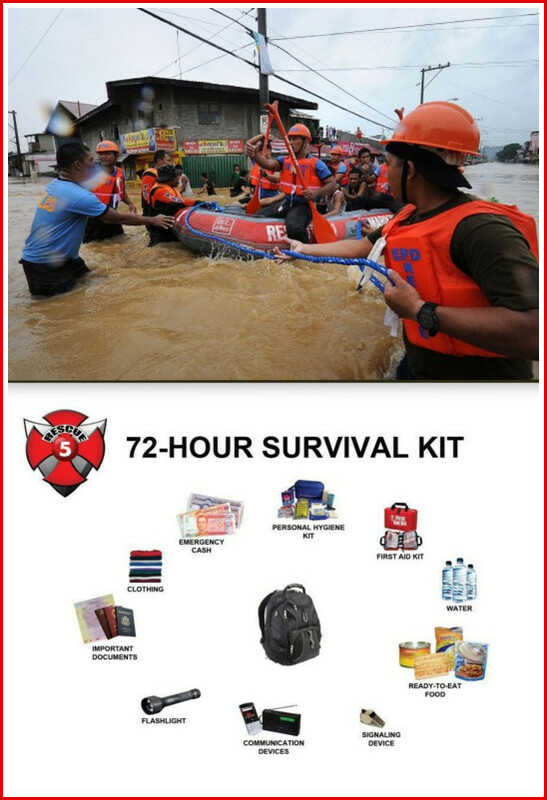 MANILA FLOODS: Disaster Survival Tips! Floods are one of the most common hazards in the country, however not all floods are alike. Some floods develop slowly, while others such a flash floods, can develop in just a few minutes and without visible signs of rain. Additionally, floods can be local, impacting a neighborhood or community, or very large, affecting entire river basins and multiple provinces. Flash floods can occur within a few minutes or hours of excessive rainfall, a dam or levee failure, or a sudden release of water held by an ice jam. Flash floods often have a dangerous wall of roaring water carrying rocks, mud and other debris. Overland flooding, the most common type of flooding event typically occurs when waterways such as rivers or streams overflow their banks as a result of rainwater or a possible levee breach and cause flooding in surrounding areas. It can also occur when rainfall exceeds the capacity of underground pipes, or the capacity of streets and drains designed to carry flood water away from urban areas. 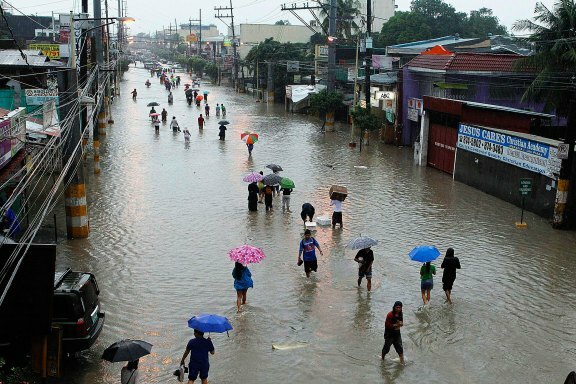 MANILA, Philippines — The Philippines is on top of the list of countries in the world in terms of the occurrence of natural disasters, the Special Representative of the United Nations Secretary General for Disaster Risk Reduction. Margareta Wahlstrom, who heads the UN International Strategy for Disaster Reduction, said a total of 33 natural disasters ravaged various parts of the country last year that resulted in the death of scores of people and the destruction of millions of pesos worth of agricultural produce, infrastructure projects, and properties. 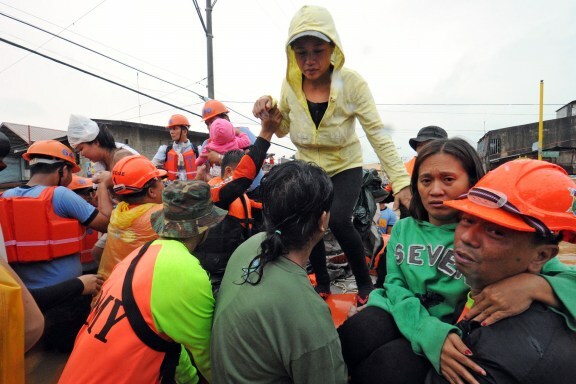 The worst disaster that hit the Philippines was typhoon “Sendong” (international code Washi) last December 17 in Mindanao where at least 1,430 individuals died. 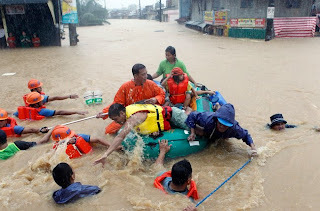 Second to the Philippines was China with 21 recorded calamities in 2011, followed by the United States with 19, India and Indonesia both with 11, Mexico with 10, Guatemala and Japan with 7, Brazil 6, and finally Bangladesh, Nigeria, Peru, Thailand, Vietnam with 5 each. Flood-hazard maps have been created to show the flood risk for your community, which helps determine the type offlood insurance coverage you will need since standard homeowners insurance doesn't cover flooding. The lower the degree of risk, the lower the flood insurance premium. Elevate the water heater and electric panel in your home if you live in an area that has a high flood risk. Levees & Dams - Levees are designed to protect hold back a certain level of water. However, levees can and do fail; and when they fail, they can fail catastrophically. 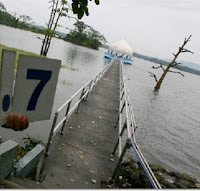 Weakening of levees over time, or as a result of weather events exceeding the levee’s level of support, can cause the levee to be overtopped or breached, thus increasing the chance for flooding. Flash Floods - Flash floods are the #1 weather-related killer in the country since they can roll boulders, tear out trees, and destroy buildings and bridges. 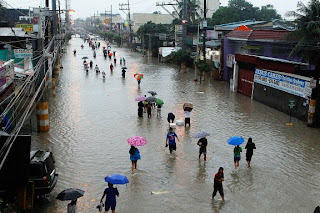 A flash flood is a rapid flooding of low-lying areas in less than six hours, which is caused by intense rainfall from a thunderstorm or several thunderstorms. Flash floods can also occur from the collapse of a man-made structure or ice dam. New Development - Construction and development can change the natural drainage and create brand new flood risks. That's because new buildings, parking lots, and roads mean less land to absorb excess precipitation from heavy rains, hurricanes, and tropical storms. The first 72 hours after a disaster is critical. Electricity, fuel, water, telephone or mobile lines may not be working. In addition, public safety services and private rescue teams may not be able to reach you immediately during a serious crisis. Each person should be prepared to be self-reliant and able to survive for at least three days following a disaster. To do so, you need to have your Red Cross Lifeline kit in order to survive. The Lifeline Kit is a portable kit or bag that contains the items one would require to survive for the first seventy-two hours when evacuating from a disaster. The focus is on evacuation survival rather than long-term survival. It is important that you will be able to distinguish the Lifeline Kit from a fixed-site disaster supplies kit. The kit should be checked every six months to make sure that goods nearing expiration are changed and that stored water is replaced to maintain its freshness and effectiveness. Put together a Lifeline Kit before another disaster strikes. It should be practical that you can carry it with you if you ever need to evacuate your home. It is also important to prepare a kit for each member of your family who is able to carry one. Older children can prepare their own kits - this exercise will train your children to make disaster preparedness a way of life. To start, let us go through the list below and start putting the kit together. Note: Contents may vary depending on individual and family needs or whatever is commercially available. - Store only non-perishable food. - In case of hypoglycemia, canned juice or hard sweet candies are recommended (not gum based or mint). - Food should be sufficient for three days consumption of every family member. - Disposable plates and utensils. - Plastic laminated ID card for family member(s) with special concerns. Indicate name, address, phone, who to call in case of emergency, contact details, the condition of the bearer and special instructions on what to do in case seen unconscious (e.g. diabetic). For children who cannot speak, they must also wear the ID card (in case they are reported missing, anyone who will find them will be able to contact their parents). - Red Cross 143 Emergency / Disaster Guide explaining what to do in various types of disasters. These should be thoroughly studied and understood before the actual disaster but must be kept for reference. (Teach all family members how to use it). - Keep these in a plastic envelope. - Important legal documents: Birth certificates, marriage contract, insurance certificates, land titles, etc. - Other important documents: academic credentials, vaccination records, medical records, etc.